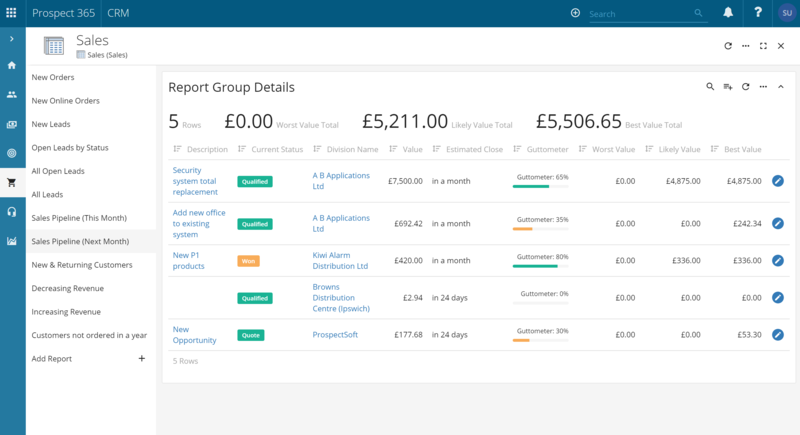 This article outlines the standard Sales Reports available within the CRM. 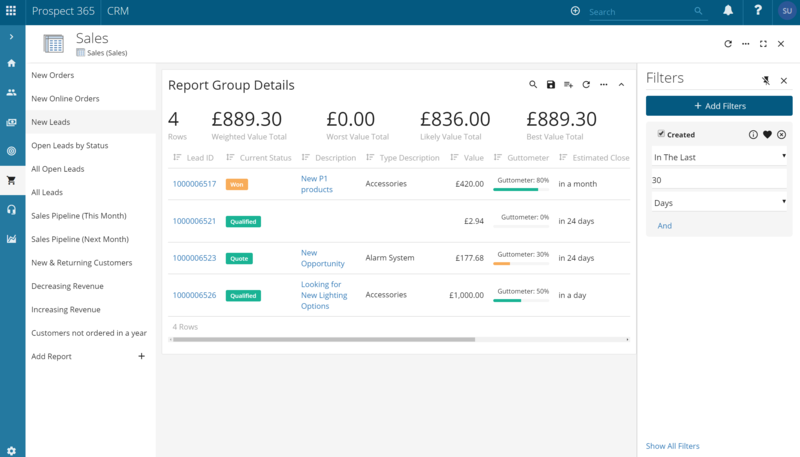 Within the CRM you have a host of standard Reports to get you started when analysing & managing your CRM data. The Sales Report group includes all standard Reports covering sales related CRM records. The 'New Orders' Report lists all the quotes that have an order date in the last 30 days. The aim of this Report is to help identify all new orders across the business. If 30 days is too recent or too long for your business, then you can change this within the filters. At the top of the Report you have a summary displaying the base value (excluding VAT) average & base value (excluding VAT) total. The 'New Online Orders' Report lists all Quotes that were ordered in the last 30 days & have a quote type of WEB. 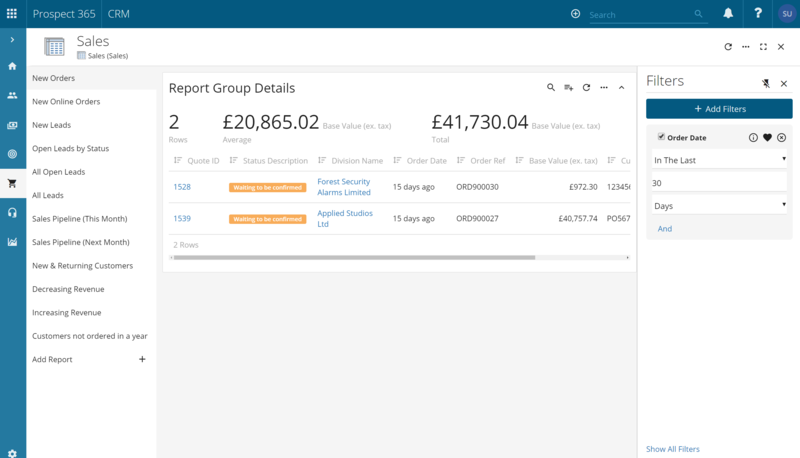 This Report will only be relevant to those that have an integrated eCommerce site with the Prospect 365 CRM. The aim for this Report is to see what orders the business has had via the website recently. Again if 30 days is too recent or too long for your business, you can change this within the filters. 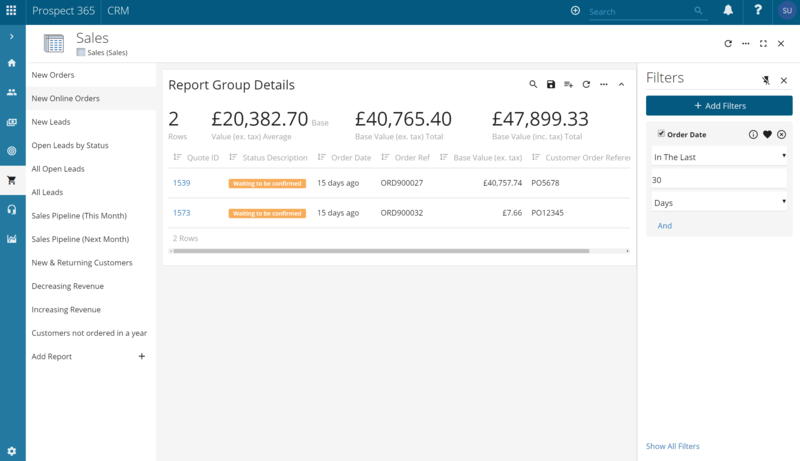 At the top of the Report you have a summary displaying the value (excluding VAT) average, base value (excluding VAT) total & base value (including VAT) total. The 'New Leads' Report lists all lead records that have been created in the last 30 days. 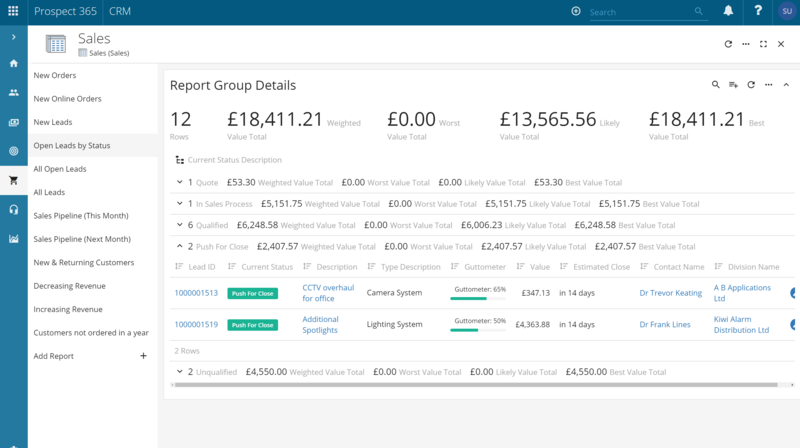 The aim of this Report is to help identify all new sales opportunities that have been recorded within the CRM. If 30 days is too recent or too long, then you can change this within the filters. At the top of Report you have a summary displaying the total weighted value, worst value, likely value & best value. For more information about these values take a look at our Worst, Likely & Best Figures Explained article. 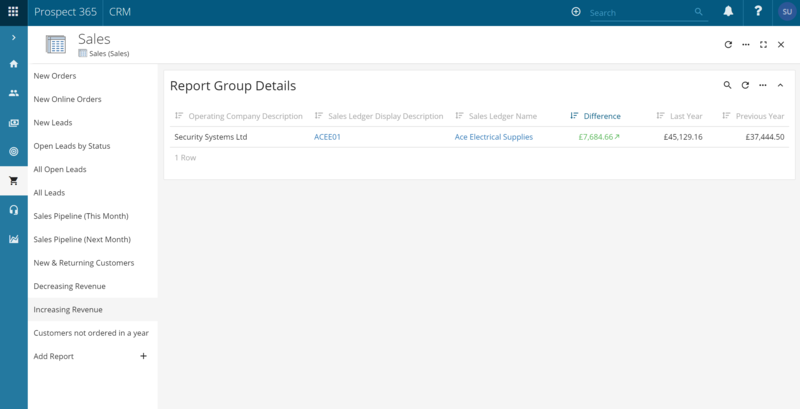 The 'Open Leads by Status' Report lists all leads in an open status & groups them by these statuses. In the example provided there are two leads in a status of Push for Close & 1 in Sales Process. To view additional information about the lead just expand the group. At the top of the Report there are some summaries detailing the total weighted value, worst value, likely value & best value. 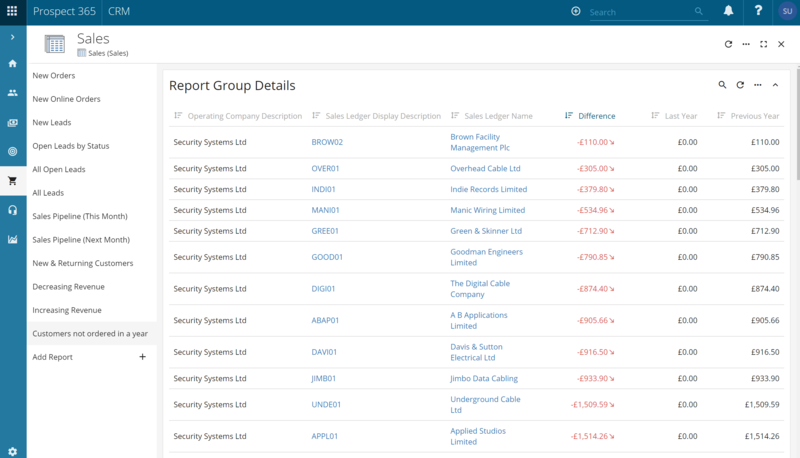 The 'All Open Leads' Report simply lists all lead records in an open status. The Report also provides some summary information for the total weighted value, worst value, likely value & best value. The 'All Leads' Report lists all lead records within the system without any filters or summaries. If you require these, you can just add them in via the further options menu. The 'Sales Pipeline (This Month)' Report lists all leads that have an estimated close date for the current month & are in one of your Lead Pipelines. 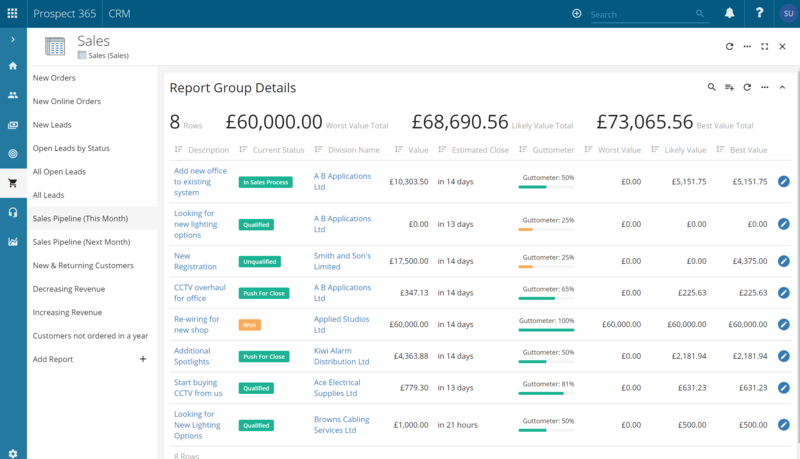 At the top of the Report you have a summary displaying the total worst value, likely value & best value. The 'Sales Pipeline (Next Month)' Report shows the same information as the 'Sales Pipeline (This Month)' but shows lead records that have an estimated close date of the next calendar month. The 'New & Returning Customers' Report lists all sales ledgers that didn't spend anything in the previous year but have done since then. 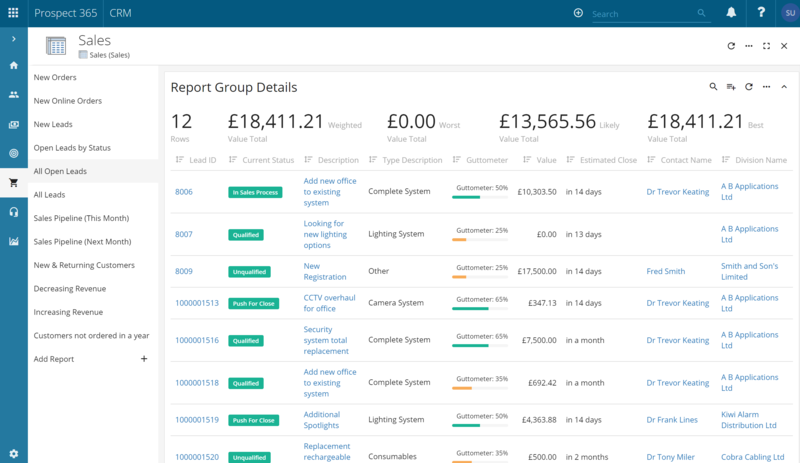 The aim of this Report is to help identify any new customers & any returning customers that didn't spend with you in the previous year, but have now come back & placed an order. The difference figure will be calculated using the sales history information. The 'Decreasing Revenue' Report lists all customers that have spent less with you than the previous 365 days, resulting in decreasing revenue. This Report is very helpful when identifying those customers that could be slipping away. The 'Increasing Revenue' Report lists all of your accounts that have spent more with you than the previous 365 days, resulting in increasing revenue. This Report helps to identify your growing & accounts. The 'Customers not ordered in a year' Report lists all accounts that have not placed an order in the last year. The aim of this Report is to help you identity customers that may be slipping away & provides a targeted list of customers that may wish to buy again.